- India Design Confluence – 2018, Ahmedabad. India Design Confluence – 2018, Ahmedabad. The first edition of a large scale event is one of the most challenging and herculean projects. When a premium design university of Ahmedabad envisioned and evangelized one of its kind, high decibel design event, our role was to create a unique brand identity and design language. An identity that would connect with the design community across the globe and attract participation. India Design Confluence 2018, was the first edition of a premium design event conceptualized and organized by Unitedworld Institute of Design, Ahmedabad. UID is among the top design institutes in India, founded with the aim to be cutting-edge, state of the art design institute, UID has industry standard workshops, labs and hands-on creative learning classrooms. Extending its thought-leadership in the discipline of design, UID evangelized and conceptualized India Design Confluence, a premium design confluence and event devoted to design to gather and celebrate three days of thinking, exploring and collaborating. Creating the design language, brand energizer, web-experience and presence, architecting end-to-end integrated marketing communication campaign spread across media like Out-of-Home, print, digital and radio. Digital Video creation for teaser campaigns and promotions, Social media marketing and outreach, venue branding and on-ground communication support. 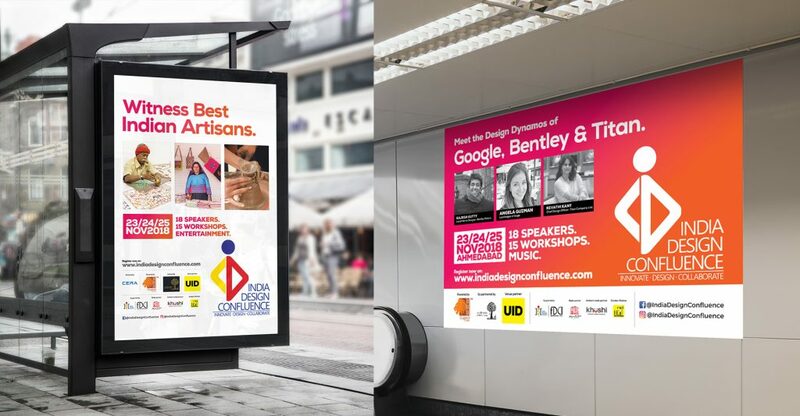 We managed the entire branding and communication gamut for India Design Confluence and empowered it to announce its arrival with great fervour and helped attract delegates. The corner stone here was to be a ‘design’ utopia, a three day deep-dive into the abstract, science and art driven confluence. We had to build a clutter breaking design language that would convey both sophistication and futuristic edge. Thus we took the word ‘Design’ gave it an edgy break and coupled it with quirky visuals that are deeply linked to the design element and reflect the many branches of design. This design language was further accentuated by a ‘Brand energizer’. A single line that encapsulated the spirit of the confluence – a place where leading, world renowned design thinkers meet amateurs who have aspirations to make it big in the design space. Thus the line – Where Design Aspirations meet Design Inspirations. The cusp and confluence was beautifully captured in this line. The key challenge of the first edition of a large than life, premium event is to communicate its scale, grandeur and the promise of it being the future driven, pioneering Confluence of ideas, Six Inches our creative partner took this challenge head on and delivered an unforgettable suit of communication and connect that did absolute justice to the mammoth India Design Confluence is. The next burning need was to create a strong web-presence as the registrations and awareness for events like these is driven by online-interaction. Our web-development team used the bold colours and forms of the design language and created a single-page format website that was the single touch-point for all information. It was a dynamic platform constructed for the ease of content updates and additions. Designed and developed the confluence collaterals, from brochures, leaflets, Event Schedules and Invitations that became the formal communication material. Being the first edition of the confluence, the challenge was to establish the thought leadership the event was brining and to create considerable noise, buzz and maintain the momentum through constant reminders. To achieve this we kept the communication simple and established the speakers to attract and gain an instant connect. A strong media-mix wherein Out-of-Home became the core, from billboards, transit media and ambient spaces all were captured. The noise was further fuelled with print ads and radio to create constancy. We ensure that India Design Confluence became a buzz-word and a subject of intrigue. The noise that was created offline also had to be replicated and achieved online. We played a key role in achieving this. The strategy was to drive online traction through videos; we conceptualized and created series of videos that ranged from promo, teasers and reveals. Power packed, 30 seconders with up-beat music were scripted and produced by us and used at varied social platforms and digital touch-points. We also wrote scripts and created Speaker selfie videos which helped create excitement. Design stalwarts from Google, Bentey, Tital sharing a selfie video that tells the viewers, I am going to attend IDC, are you? We did a mailer series that traversed across intrigue, excite and reveal. Further on to add frequency, banner ads across varied digital platforms were executed. In addition to this we did and elaborate Google ad-words campaign, Facebook ads that were highly targeted which fuelled and enhanced conversions. Right from devising content strategy, calendar to create templates and content creation and curation to on-ground live social media support, we managed the entire social media universe for IDC. Facebook, Instagram and Twitter were the key platforms that were managed. The content strategy was designed to drive intrigue and conversion. Videos and visual posts were the key elements apart from that Design trivia were shared to make the page more knowledge intensive. Face book live, Insta updates, venue pictures we captured the live action and shared it. Adding to the universe of IDC and increasing its glam and design quotient we designed edgy merchandise that became talking points. Tees, badges, bags! These became the small giveaways’ and post event impact and reminders. Having managed the pre-event phase flawlessly, we also did a par-excellence work on venue branding. It started with a detailed recce of the 30 acres campus of Karnavati University, identifying the branding spaces and conceptualizing ideas for the same. The venue branding universe included – Welcome gate, backdrops, standees, pillar branding, drop-downs, ID Cards, invites, schedule, speaker booklet, car passes, posters, innovative idea like cubes, event ticket, navigation signage and a lot more.